Riches of Ra could have been inspired by another Egyptian-themed slot called Book of Ra Deluxe, released by Novomatic. Developed by PlayNGo in honor of the Egyptian sun god Ra, Riches of Ra challenges players to win a top fixed jackpot of 2,500 coins along with several more coins in the slot’s free spins and bonus feature. There is nothing innovative about PlayNGo’s Riches of Ra. It is just like any other Egyptian-themed slot in the online slots gaming world, based on standard slots rules. Players need to place a bet, click on the spin button, and collect payouts if a winning combination of symbols is displayed on the reels at the end of a spin. If not, they can place another bet and try again. Riches of Ra has 15 paylines and players can bet up to 5 coins per active payline, choosing from coin values that range from $0.01 to $0.25. This means that players can bet a minimum of $0.01 to a maximum of $18.75. If players feel daring enough to bet max, they only have to click on the Bet Max option. The slot allows players to spin the reels automatically using the Autoplay option. Players can also customize their gaming experience by altering the settings. 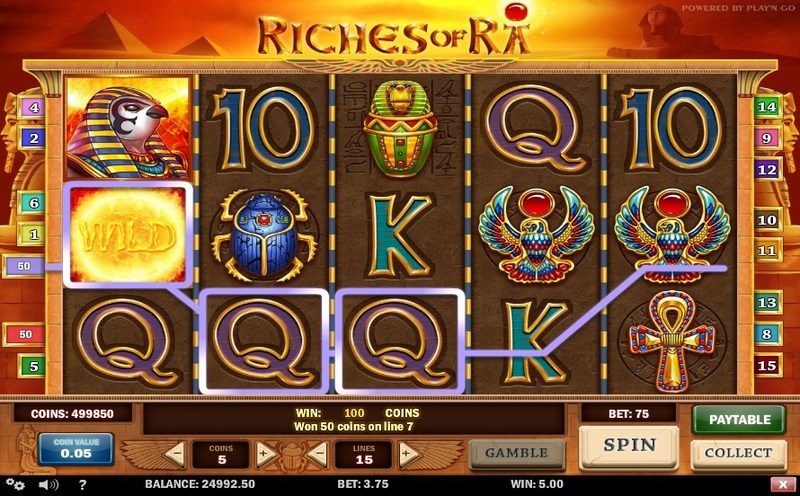 Riches of Ra is a simple, well-designed PlayNGo online video slot. The dark brown reels are set against a backdrop of pyramids, sphinxes, and Egyptian statues. The reels, which are separated by gold and blue rods, feature brilliant symbols of scarabs, Egyptian gods and goddess, and so on along with high-value card symbols. The Ra symbol serves as the wild, substituting for other symbols and helping players complete winning combinations. The Ra symbol can appear in the form of stacks to help players unlock the free spins feature. The free spins round is activated when stacked Ra symbols appear on the fifth and first reels. These symbols then remain fixed in position as long as the free spins last, leading to incredibly large wins for players. Players will receive 15 free spins every time they activate the free spins round. On the downside, players cannot activate the free spins round while playing a free game. Riches of Ra comes with a bonus game, which gets activated as soon as players hit a combination of three bonus Urn symbols anywhere on the reels. Players will then have to choose an urn to find cash prizes of up to x150. Riches of Ra enjoys a great deal of popularity among PlayNGo fans for its simple rules, player friendly game design, easy-to-understand bonus features, generous payout structure, and affordable betting range. Since it doesn’t have too many complicated bonus features, it is the ideal PlayNGo slot for beginners.